Want information about Frederick County at your fingertips? Why not try one of these great apps? A unique way to get more information on everything Frederick County has to offer or take along for your next visit. 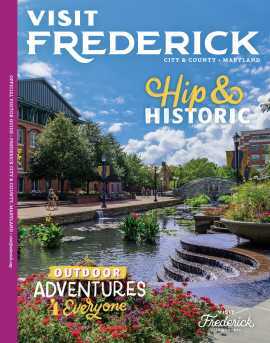 Experience the historical evolution of one of America’s great small cities from pre-colonial times to present day – through rich multi-media content that includes hundreds of vintage images that relate to preserved landmarks in Frederick’s magnificent historic district. The tour’s unique production approach draws from both national and local, human perspectives. The Frederick Walking Tour is comprised of seven mini tours, with each tour dedicated to a specific theme and timeline, with stops that are located in close proximity to one another. Other features include a video on use of the app, GPS tracking and a written transcript of each tour stop for the hearing impaired. This FREE app is the ultimate travel guide and planning tool for Maryland&apos;s Civil War Trails. Maryland Civil War Trails are a great way to explore and discover the people, places and stories of Maryland&apos;s pivotal role in the Civil War. Along three scenic drives and one dramatic walking tour, you will be immersed among the famous like President Abraham Lincoln and General Robert E. Lee and among the lesser known men, women and children who lived through some of America&apos;s most trying times. This app will help you find your way to more than 225 sites, museums and battlefields while at the same time providing information on events, what to see and do and where to stay and dine.